The center builds upon the virology research at the Morgridge Institute led by Paul Ahlquist, the John W. and Jeanne M. Rowe Chair in Virology, and also comprises two additional Morgridge investigators and University of Wisconsin-Madison faculty, including Tony Gitter who specializes in computational biology. The Rowe Center will work to understand the big-picture questions of how viruses function and interact with their hosts. One of the goals is to develop broad-spectrum antivirals, which are drugs or vaccines to target entire families of viruses. There are hundreds of viruses that threaten human health, but today these are almost exclusively combatted by targeting each individual strain, rather than by finding common weaknesses. With sustainable, flexible support from the Rowes, the center will grow a robust virology research program in partnership with scientists and students at UW-Madison. The Ahlquist Lab seeks to understand and control positive-strand RNA viruses—a large group that includes the Zika, SARS, MERS and many more viruses—as well as HIV and cancer-causing papillomaviruses. The center’s work is similarly advanced by the Gitter Lab, which is developing approaches to unravel biological networks in areas such as viral replication and virus-induced cancers. 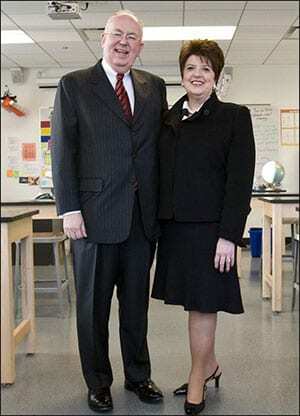 The Rowes have been deeply involved in the Morgridge Institute’s first ten years. John served on the Morgridge Board of Trustees and as chair of the WARF Board of Trustees, and together John and Jeanne broadly supported the humanities and education at the grade school, high school and university levels. John says he and Jeanne have come to see biomedical research, and virology, as an area where their philanthropic support can change lives and help people. John, a graduate of the UW-Madison Department of History and the Law School, says their commitment to the Morgridge Institute comes from a belief in the possibility of science. Brad Schwartz, Morgridge CEO, says the Rowes’ gift is accelerating virology research at the institute and across UW-Madison. Using seed investments from the center and partnering with the university, the Morgridge Institute will soon launch a search for a fourth new virology faculty investigator specializing in cryo-electron microscopy (cryo-EM). The position builds on a major initiative to create a new campus cryo-EM facility at the Department of Biochemistry through a partnership with the Morgridge Institute, the School of Medicine and Public Health, the Vice Chancellor for Research and Graduate Education, and the UW Carbone Cancer Center, to enable an immense range of multi-disciplinary, multi-investigator, transformative bioscience.